Squeeze the lemon juice into a bowl and add the olive oil. Season with salt and pepper and stir in the fresh, chopped basil leaves. Heat a frying pan until very hot and season your swordfish (or tuna, cod, etc) with salt and pepper. Place in the pan and cook for around a minute on each side until golden. This will leave the fish slightly pink in the middle, so if you don't like the idea of this, feel free to cook it a bit more. Divide the fish between your serving plates and spoon the sauce over the top. Note: based on a variation of a Jamie Oliver dish. 222 members have added this recipe to their cookbook. This was great. Flavors just right. Yummy. The garlic goes into the oil and lemon juice, I guess. 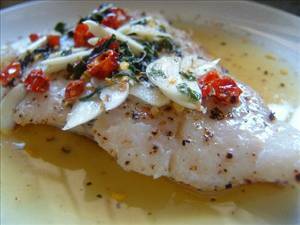 There are 221 calories in 1 serving of Grilled White Fish with Salsa di Giovanna. Calorie break-down: 58% fat, 3% carbs, 38% protein.